This morning we woke up early, got ready and went downstairs to get breakfast. During breakfast I dropped a bagel loaded up with cream cheese and honey toppings side down right on my chest. CSP laughed so hard at me I thought he was going to stroke out! So much for my clean shirt!!! We got on the road to Port Canaveral just before 10 am arriving about 11:20. By the time we got parked, unloaded the car, got through port security and check in, we were able to walk right on the ship! LOVE Disney’s organized check in system. We went straight to Guest Services to borrow a power adapter for my CPAP machine. Then we went to the Promenade Lounge to change our dining rotation. Easy peasy. Next up was lunch at Triton’s. We prefer to eat at the sit down restaurant on embarkation day because Cabanas up on the pool deck is packed with people. Lunch was very nice. The people at the table next to us were first time cruisers. I remember that feeling! After lunch we went back to the Promenade Lounge for our Facebook group’s meet and greet. One thing I always recommend to people cruising is to join your Facebook cruise group. You get to know some of your fellow cruise mates ahead of the cruise and if you’re a newbie you can learn so much! Plus you can sign up for gift exchanges and special events. Our group administrator was just amazing! So my main goal at the meet and greet was to let her know how much I appreciated her. In line to check in at the meet and greet I met Diane and her mom. Diane is mentally challenged and turned 30 on the cruise. It has always been her dream to go on a Disney cruise. Her mom is part of our Facebook group and posted Diane’s picture so we’d all know what she looks like so we could wish Diane a happy birthday. It was so great to finally meet them! Our rooms were ready at 1:30 pm so after the meet and greet CSP and I went to our room to drop off our bags. Upon arrival to room 6534 we found our Castaway Club gifts: a sling pack bag and 2 cool luggage tags. and I discovered Disney left us a little giftie for our anniversary! I also discovered CSP had packed his pockets full of Cholula hot sauce for the cruise. Keeping it classy! CSP LOVES watching the dock workers prepare the ship from our veranda. Then unfortunately it was time for my least favorite cruise activity- the muster drill. UGH. Our muster station was up on deck 4 right in the sun. After the dreaded muster drill we went down to the new Crown and Fin pub for a cocktail before we set sail. 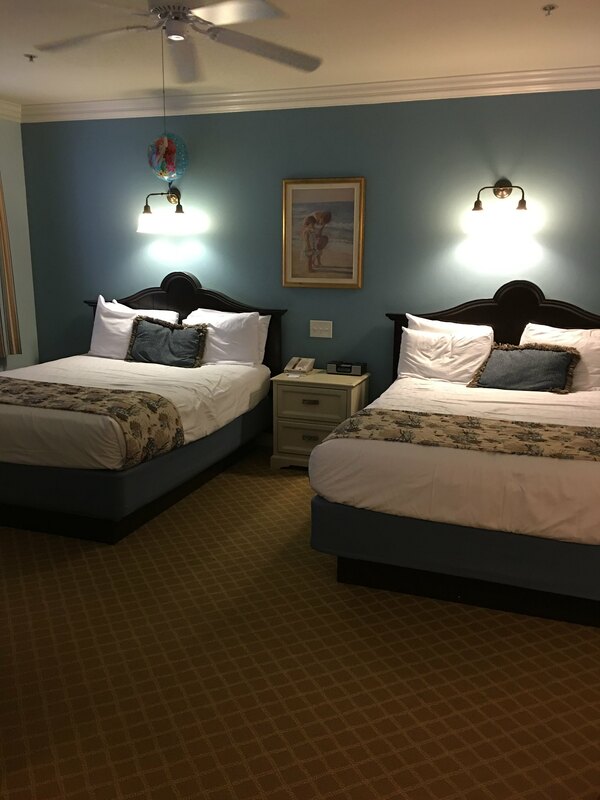 The Wonder recently went through a large renovation and the ship is just beautiful! You’d have no idea it’s 19 years old unless someone told you! I enjoyed my first coconut mojito of the trip and CSP had a bourbon fizz. To our surprise we noticed we had started moving at 4:45, 15 minutes early. We watched the shoreline disappear from the pub then headed back to our room to unpack. Upon arrival we found an anniversary present from Laci & Rusty! L&R are a couple we “met” through our Facebook cruise group. Turns out they only live a couple hours from us and we have tons in common! They gave us the sweetest tea cup set! We were unpacking when we ran out of hangers. I stuck my head out our door and found our room steward Niel. He brought us an extra dozen hangers and was so sweet! Then we got dressed for dinner. Tonight we were in Triton’s for dinner. They had a French menu so CSP was thrilled to eat his escargot! I had my favorite creme brûlée for dessert. After dinner we spotted Pluto on the way to the shops onboard to pick up our traditional magnet with the year on it and a gift for CSP’s mom who’s home pug sitting. After our little bit of shopping we went back to our room for bed! It was a long, but great day! Today we drove down to Orlando. Well, I drove while CSP slept! He looked so funny in his get up. 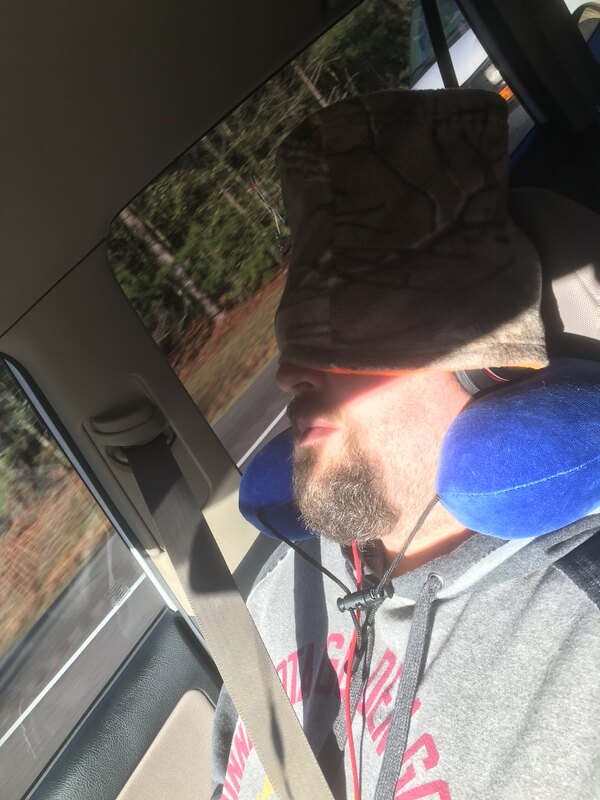 He had his neck pillow, his sunglasses, and headphones all on at once along with his neck gaiter pulled up over his eyes to block out the sun. The drive was pretty uneventful except when we ran into a bunch of traffic because of 3 car fires and a semi truck fire! Why were all these vehicles on fire?? It wasn’t even hot out! Weird. We got to Orlando about 5pm and pulled into Old Key West Resort at Disney where Amy, Kevin, Ellen, & Colin were waiting for us! It’s a beautiful resort. We got settled in quickly. 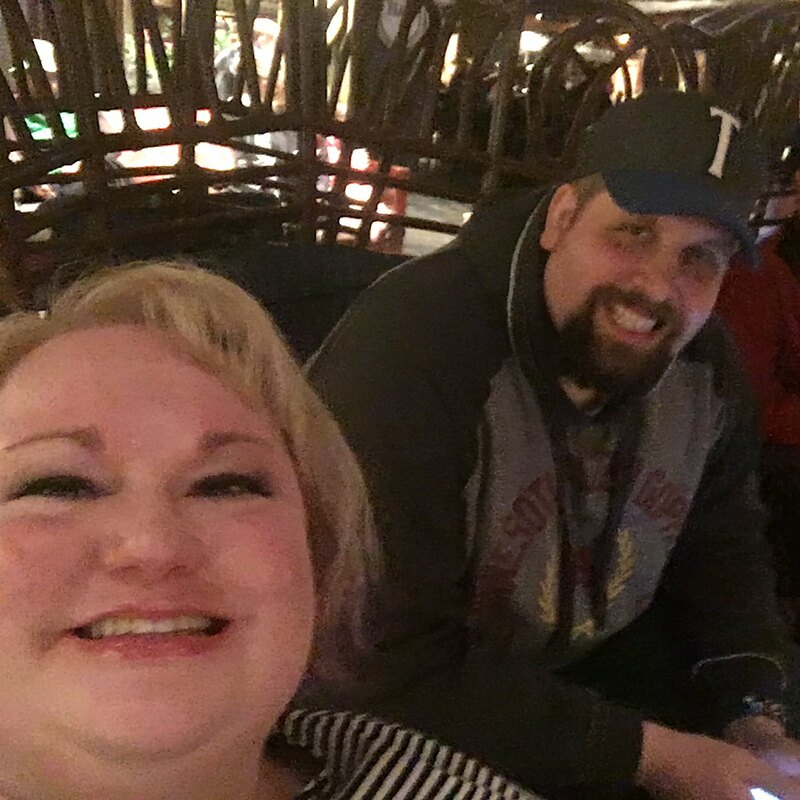 Then it was time for dinner at ‘Ohana! 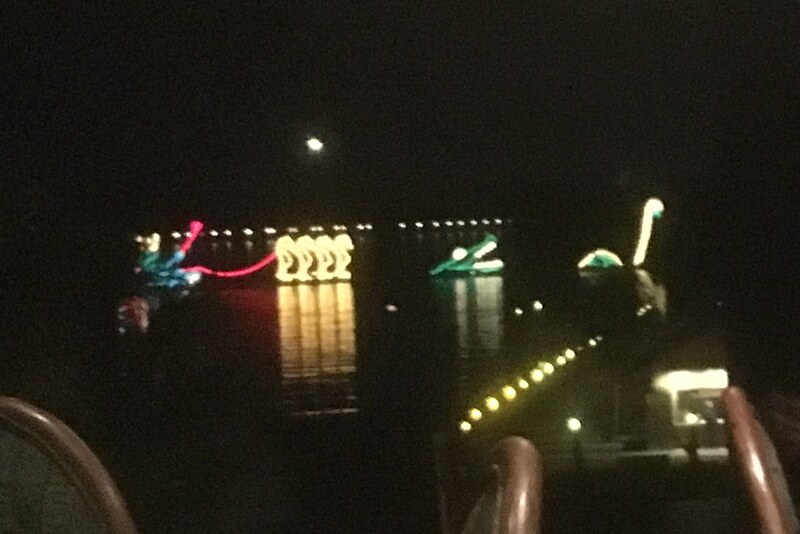 We had a wonderful dinner and even got to see the electric water parade! Back to the resort for bed! Big day tomorrow as we head to the port!